CLPR has been a pioneer on the legal rights of transgender persons in India. Towards this aim, over the last four months, CLPR has been actively working on two main research issues. In NALSA v. Union of India & Ors., the Supreme Court mandated reservation for transgender persons in public employment and educational institutions. However, this has not materialized even now in 2018. There is no legislation that has been enacted for reservation of transgender persons nor is there clarity as to how the reservation will be carried out. In this regard, CLPR is drafting a policy brief recommending how reservation for transgender persons should be implemented, by analyzing the legal and constitutional perspectives. 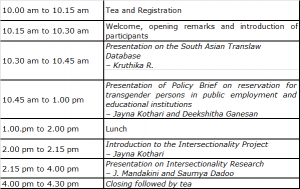 Another area of research at CLPR is to examine gender identity along with the intersections of caste and disability. We have been carrying out our research in Kerala, Karnataka, Tamil Nadu and Andhra Pradesh by conducting interviews and surveys to understand the intersectionality of caste, with gender, gender identity and disability and have some significant insights. This consultation is to share our preliminary findings and get valuable inputs from community members and experts.